The CR15xB Optimus Yellow is a calibrated, professional grade sound level meter for noise measurements that must meet the relevant international standards. Despite being a powerful meter it is extremely easy to use, ensuring you get the correct measurements from the start. Making measurements usually consists of checking the calibration (adjustments are automatic), recording a voice tag if required, and then taking the readings. As this meter is a data logger all the measurement parameters are stored along with time, date and other relevant information. If you decide at a later date that you need an Integrating sound level meter or even octave band filters then we offer a simple upgrade path. The Optimus Yellow is ideal for applications that need a wide measurement range (20 to 140 dB) but do not need an integrated average (Leq or Lavg). This data logging version offers more indepth reporting via the NoiseTools software, which is included with the meter. The Optimus Yellow has both AC and DC outputs, making it ideal for connection to a data logging system via a suitable A/D converter. Please note that some outputs require an extra cable. Please contact us for more information. The display shows the commonly used parameters but the meter stores the maximum sound levels for all time and frequency weightings, along with a time history for the more common ones. 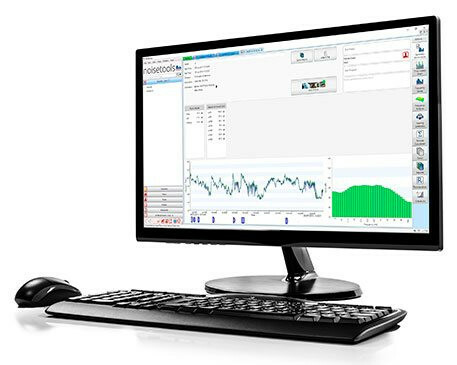 The overall parameters for the noise measurement are stored for all frequency and time weightings. The meter can be set to store time history measurements at one of a number of rates between 10ms and 2 seconds. Four maximum sound level (Lmax) values are stored for each sample: LAFmax, LASmax, LCFmax, LCSmax. The meter is already storing measurements. It stores everything, no need to choose anything here. At the end the measurement process press the Stop button. The display will show the most common measurement parameters: Maximum Sound Level and Minimum Sound Level with the usual "A" weighting applied. Using the up and down keys, you can also view the "C" and "Z" weighted values. The measurement is automatically stored at this point, ready for download to the NoiseTools software. The data logging Optimus Yellow (CR151B and CR152B) include the NoiseTools software - there is no extra charge for this. You can download the software to evaluate it before making a purchase. You can buy the Optimus Yellow as a sound level meter on its own or as part of a noise measurement kit. For this grade of meter, most customers have the measurement kit, as it includes a sound level calibrator, which is a requirement for many noise regulations.